Shouldn’t have packed up the existing stash… I thought I’d run out of yarn! 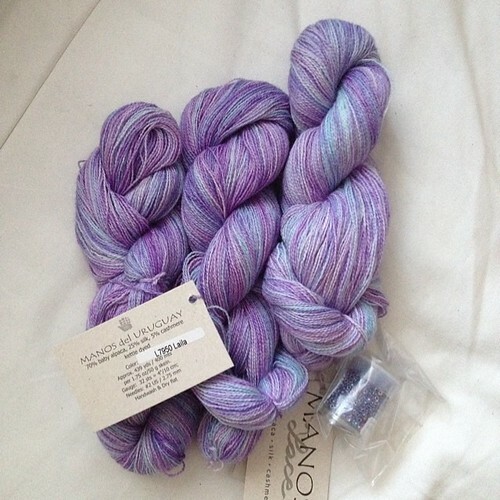 I spied this exquisite bit of goodness when Ellen at Earthfaire posted it as an option for the Nadira Shawl. As I seem to have lost my mind to lace knitting of late, I had to have it. It was finally restocked last week and so, I grabbed some, along with beads – not called for in the pattern but a tiny touch of that I think will look well. This entry was posted in Crochet, Knitting, Projects, Scaves and Cowls, Yarn Pr0n and tagged Baby Alpaca, Beading, Beads, Cashmere, Earthfaire, Laceweight, Manos Del Uruguay, Nadira Shawl, Purple, Shawls, Silk, Yarn Pr0n. Bookmark the permalink.